Schematic of intermodal four-wave mixing: The intense pump pulse (green), guided in a superposition of the LP0,4 and LP0,5 modes (mode image inset), is converted to broadband anti-Stokes (blue) and Stokes (red) pulses along the length of the optical fiber. Nonlinear frequency conversion is a crucial technology for operating high power pulsed laser systems at the arbitrary wavelengths required by applications ranging from biological imaging to undersea communications, among many others. A stable and efficient solution based on guided waves, for instance using optical fibers, is in high demand; however, efforts to generate such a device have been limited by the need to conserve momentum, or phase match, in fibers. Multimode fibers provide the ability to examine nonlinear interactions between guided modes—with the idea multiple modes allow for multiple possible combinations to achieve phase matching. However, in practice, typical intermodal four-wave mixing interactions are only phase-matched over narrow wavelength ranges, leading to impractically narrowband nonlinear gain, inefficiencies in conversion, and limitations in the ability to spectrally and temporally tailor the converted light pulses. 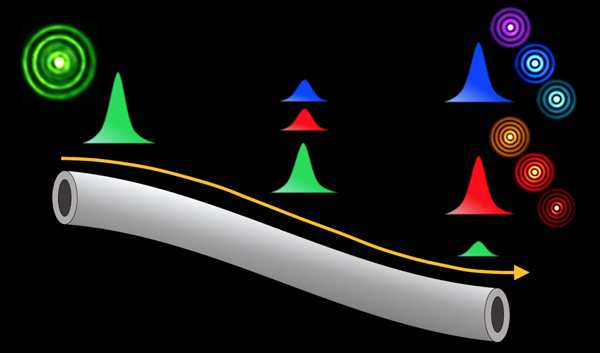 To solve this limitation, the research group from the Nanostructured Fibers and Nonlinear Optics laboratory of Boston University, led by Professor Siddharth Ramachandran, has demonstrated that tailoring of the relative intermodal group velocity, in addition to phase matching, is the key to unlocking extended nonlinear gain bandwidths. This new work highlights an intermodal four-wave mixing process where a pump pulse guided in a superposition of the LP0,4 and LP0,5 modes is converted to two group-velocity-matched pulses in the LP0,4 and LP0,5 modes at wavelengths shorter and longer than that of the pump, respectively. By matching the group velocities of these output pulses, the phase-matched bandwidth is increased by more than order of magnitude compared with typical intermodal processes, leading to broadband gain regions separated by nearly an octave (63 nm centered at 1553 nm, and 17 nm centered at 791 nm). By seeding this process, the authors demonstrate an efficient, quasi-CW, high power and wavelength tunable all-fiber analogue of the ubiquitous Ti:Sapphire laser. This work is published in Photonics Research, Volume 7, Issue 1, 2019 (Jeff Demas, et al., Intermodal group-velocity engineering for broadband nonlinear optics). In general, these results represent a new parameter space in which to design and implement intermodal parametric nonlinearities—analogous to group velocity dispersion engineering in photonic crystal fibers. Future work will explore using the design flexibility inherent to these multimode systems to target specific wavelength bands for applications underserved by conventional frequency conversion systems, as well as exploiting the bandwidth and group-velocity-matching in these systems to explore fiber-based four-wave mixing in the ultrafast pulse regime.